The 451 foglights are nice, much better than the 450 ones. They are more robust too so are a prime target for modding. 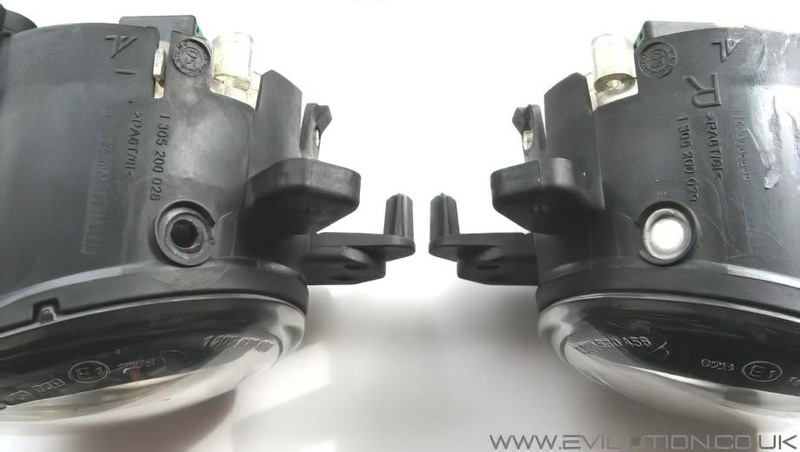 The smart standard foglights are standard throughout many Mercedes models. Despite being sold by smart for over £70 each and most Bosch resellers selling them for about £45 each, they are relatively easy to buy second hand. I got these ones from ebay for £15 including delivery. Smart part numbers are A251 820 08 56 and A251 820 07 56. Bosch part numbers are 0 305 076 002 and 0 305 076 001.
numbers on the lables of both units so it's easy to get the information wrong. You know what they look like from the pictures below. Go to Ebay and type in Mercedes Fog. Scan through the results to find them. pricks who drives around with them on all the time because you think it looks cool. Lets add some really subtle sidelights into them. Look at the fog light units, mine had a wax paper disc glued over a hole.